Gregg's Blogg » Blog Archive » What Are They Playing in Heaven Today? What Are They Playing in Heaven Today? This week’s blog is not harp guitar-related, but on a different topic I long ago became associated with: the gospel music of Washington Phillips (my title being of course a riff on one of his best-known songs). Phillips’ popularity continues to increase among musicians of all stripes, and for multiple reasons – one being the mysterious angelic-sounding instrument(s) he played. Long and erroneously thought to be a Dolceola, a rare but well-documented American novelty fretless zither with a keyboard, it was Austin Statesman music critic Michael Corcoran who first exposed the misconception back in 2002. Garry’s “two-simultaneous zithers” theory is an amazing bit of detective work and provides an unwieldy but theoretical working answer to the sounds we hear on the recordings, assuming he recorded with the two re-purposed fretless zithers Phillips holds in the famous photograph. Which I originally believed he did, and still do – after all, it was published during the month following his first recording session. However, the ever-diligent Mr. Corcoran has now thrown a new wrench into the mix! He has discovered another possibility: a huge custom fretless zither that Washington Phillips built himself! Phillips even named it: the “Manzarene.” The brief article is from the Teague (Texas) Chronicle, Nov. 8, 1907, and is a wonderful find (if one ignores the casual racism). The only detailed clues it reveals are that it was homemade and it was large: about 2 by 3 feet in size and 6” deep! Playing with two hands was also mentioned, as one would expect for a giant fretless zither. The thousand dollar question: Was this handmade creation what he played on the recordings?! It certainly could explain the expanded range of custom stringing we hear. And for me, an additional important question: Was this the mysterious “homemade” instrument described by so many witnesses to both Corcoran and myself? Both questions are related, and now we must perhaps re-consider all the excruciatingly complicated work Garry and I did, along with all the other clues in Corcoran’s articles and our own investigations. By “we,” I mean someone else! Garry is gone and my “homework” was completed a dozen years ago. In any event, there aren’t enough specifics to positively I.D. the Manzarene as the – or one of the – recorded instruments. There is only its new candidacy if one feels a need to disprove Garry’s and my existing proposals – and those have held up. So while it’s certainly possible – and a romantic notion – that Wash’s personal Manzarene survived twenty years to be played for the recordings (or, say, the first session), it’s equally likely that it had fallen apart long before then. That got me re-thinking about “the” homemade instrument reported by witnesses, and I had to re-familiarize myself with the vast amount of conflicting information reported in my two articles. What a puzzle! The one thing the newly-discovered Manzarene convinces me of is that this ingenious musician was capable of continually creating simple but effective – and musically rich – fretless zithers by any means necessary – from scratch, from cannibalizing pianos, from completely re-configuring production zithers, and building more from salvaged parts. All he really needed were a few simple tools and new steel strings when required. 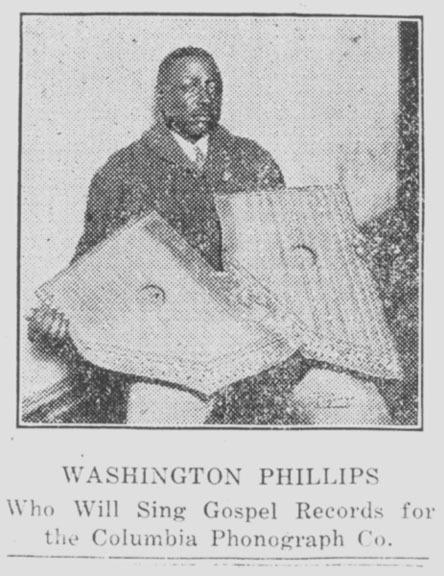 At various times, Washington Phillips played a giant homemade box zither, a secondhand Phonoharp and gizmo-less Celestaphone that were possibly assembled into some giant super-zither, and at least one, but possibly multiple, additional homemade zithers, smaller and eventually played with just one hand. Yes, Washington Phillips could have simply played guitar like all the others, but he was serendipitously struck by a different muse. And we continue to find fascination with the story behind it all. From the Dolceola (not) to a pair of re-purposed American fretless zithers (most certainly) to the giant Manzarene and later one-hand instruments – could Washington Phillips be any more enchanting?! Purchasing the Dust to Digital recording of Washington Phillips, I can say the music is haunting and mysterious. As a music buff my recordings extend from bluegrass to opera excluding present C&W. All involved in bringing this musician to light deserve a huge thanks. Do we know where Phillips got the name “Manzarene”? Would it be a take of Nazarene”? Of course, I have scanned several articles so perhaps I missed this information. Thank you for your consideration of my request. I had that same thought many years ago. Guido van Rijn, who lives in the Netherlands, first reissued the 78s, as clean as he could get them, in the early 1980s. There have been several reissues, getting progressively better, as time has gone on. I have my own thoughts, but they echo yours. I can see a newspaperman talking to Mr. Phillips, and hearing ‘manzarene’ instead of ‘Nazarene’. I don’t know if anyone knows enough of the area’s localism to know, though.